All I ever heard about while pregnant was what I was going to need for the baby when she made her grand debut. Even the pregnancy groups I joined on social media had multiple threads laying out the “must haves” for babies. At the top of the list, besides the obvious crib and diapers, was the DockATot, the baby co-sleeper and lounger. This was the first time I was hearing about this being a must have for babies. Sure I have seen the DockATot before and read the reviews but it couldn’t actually be worth the money, could it? So I decided to give this infamous co-sleeper a try. Anyone who knows me or even follows me on social media has learned that Avery is not the best sleeper, especially for her naps. Since I’ve quickly discovered that naps dictate how well a baby sleeps at night, I have been focused on trying to get her to sleep better during the day. 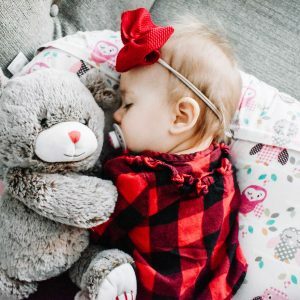 In my online mom’s group, many individuals have raved about how the DockATot has “transformed” their children’s sleep. Also, in my desperate attempt to get more sleep at night, I turned to google where I learned more moms suggested the DockATot as a way to help babies sleep better and longer. 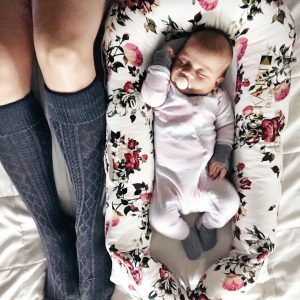 So what is the DockATot? The DockATot first and foremost was designed in Sweden to be a multi-functional lounger and co-sleeper for children up to 3 years old. It is made from 100% all natural cotton and is handmade in Euope. There are two sizes: Deluxe for children 0-8 months old and the Grand for children 9-36 months old. 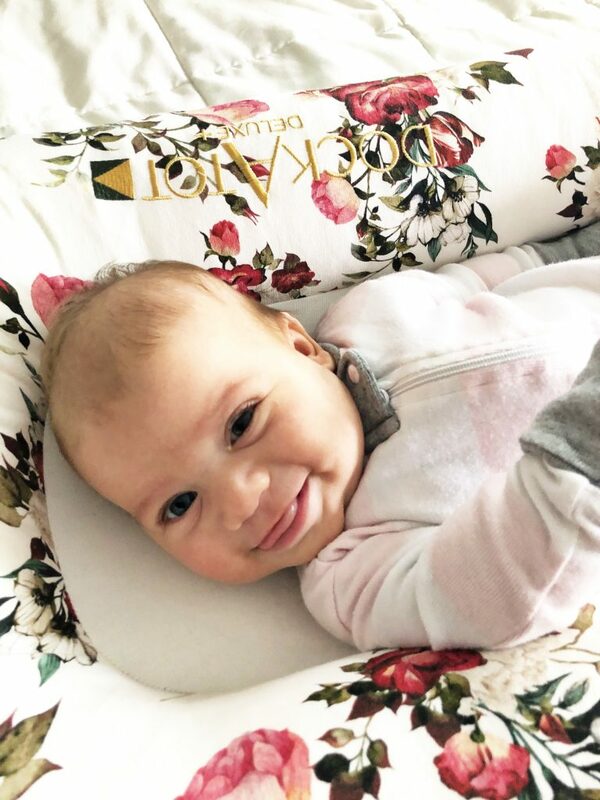 The DockATot has been tested for breath-ability and is OEKO-TEX certified which is an independent testing and certification system of materials for harmful materials. To see more on this testing system click HERE. To see all options and patterns available head to dockatot.com and get $10.00 off all docks through this link! kept and used when traveling in order to store and carry. It is also extremely easy to take the fabric off the lounger to wash and dry. I did find it a little difficult to reassemble but after a couple of times, you get the hang of putting the fabric back onto the pieces. 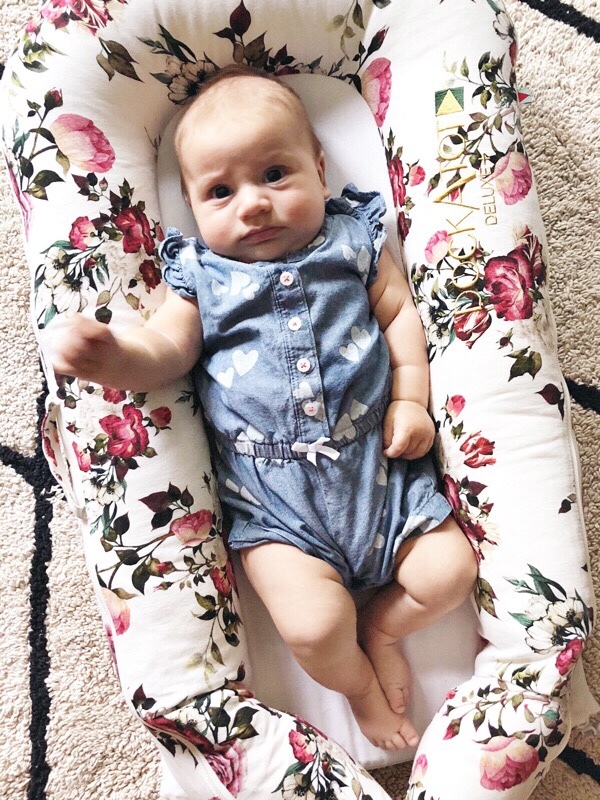 That is the nice thing about the DockATot is that the fabric is washable because we all know how often babies spit up or small children spill things. Avery immediately took to this co-sleeper for naps. I had been resigned recently to holding her while she tried to nap or putting her in her car seat and going on long walks. Avery loves feeling like she is enclosed when she is napping which is why putting her in her crib with all it’s open space makes her cry almost instantly. Putting her in the DockATot for naps started to help immediately, instead of crying when I put her into it, she fell asleep and most importantly stayed asleep to take a good nap! Another thing that I love about the DockATot is that the baby can lounge in it while awake. Since it is light and portable, it easy to carry from room to room in the house so I can set the baby down in a safe space. I use it in rooms while put clothes away or clean up. I also have used it outside a few times. If Avery is tired enough, after playing for a little while, she will fall asleep and take a nap while already in the DockATot. One thing that I don’t use this for is co-sleeping. I also do not use this while the baby is sleeping in the crib or pack n play unsupervised. We are not a co-sleeping family so I actually have not tried it out in that aspect. During my research though, I have read that the DockATot is a safe option for co-sleeping when following all safe sleep guidelines while others have said co-sleeping is never safe. There will always be mixed reviews on co-sleeping and I encourage everyone to do their research and decide on what is best for your family. To learn more about safe sleep for your little one head to Safe to Sleep. 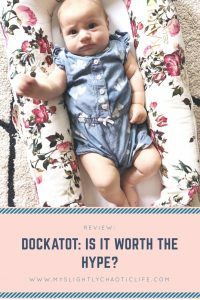 I personally love the DockATot and feel that it has been the answer to our nap time nightmare. Since Avery is getting better sleep during the day she is actually sleeping longer and deeper at night. 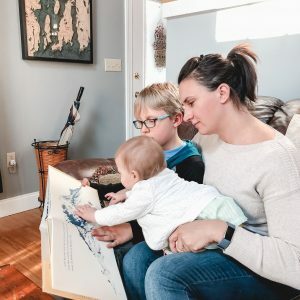 I would absolutely recommend this co-sleeper and lounger to other moms. 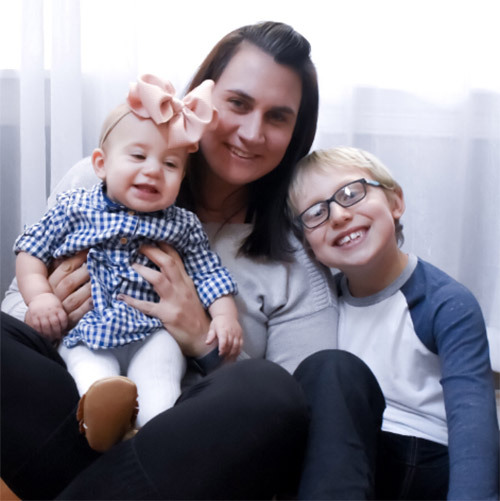 If you are looking to get your very own DockATot head to dockatot.com through this link and get $10.00 off all docks! Link expires July 2018 so hurry over and get yours today. 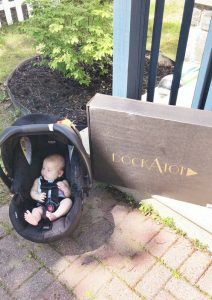 We loved our Dockatot too!! It’s such a great invention! Like you I had always heard about th DaT too but didn’t give in to getting one until Olivia was big enough for the grand. I so wish I would have caved sooner! I can’t wait to try this with my second baby girl this time around! I hope it works the magic everyone talks about! Your daughter is adorable! I wish I had one of these when my kids were younger. It would have been a game changer! Thanks for posting your review. I’ve been wondering about these! Storing for later!! 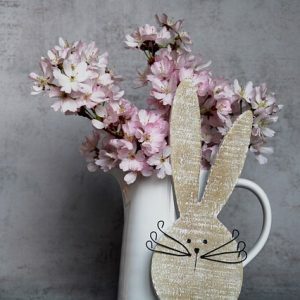 Cute print too!